Descend into darkness and brave the depths of a forgotten kingdom in Hollow Knight, an atmospheric and challenging 2D action-adventure for Nintendo eShop on Nintendo Switch. Explore the vast interconnected world of Hallownest, unravel ancient mysteries and conquer a menacing evil. Buried far beneath the fading town of Dirtmouth sleeps Hallownest, a once-great civilisation now fallen to rack and ruin. Explorers and thieves are drawn below the surface in search of riches, glory and answers to old secrets, but amongst these plundered halls now roam tainted creatures and bizarre beasts, corrupted by a sweet, sickly poison that seeps through the soil. 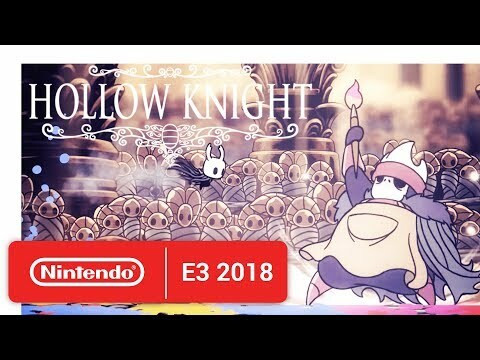 As the eponymous traveller Hollow Knight, journey deep down into the vast labyrinth of caves, corridors and ruined cities that make up this eerie, decaying dominion. Scattered throughout the soil lie towns and settlements home to a cast of weird and intriguing characters, while riddles and treasures guarded by vicious creatures await those who venture off the beaten path and investigate every creak and crevice. If you’re looking to descend further into the darkness, then be prepared to defend yourself against hordes of corrupted creepy crawlies. Move nimbly to evade enemy attacks, dodge incoming projectiles, master wall jumps to claim the high ground, then take the offensive with your trusty sword and powerful abilities. Defeated enemies will leave behind Geo – fossils that can be exchanged for new items and shortcuts – as well as a mystical energy that can revitalise your weary body or be channelled into powerful new abilities. Should you be bested in battle, a shadow of your former self will remain where you once stood – find it and defeat it to claim back your worldly riches. Curious characters. When you grow weary of spelunking, return to the surface and venture into the peculiar town of Dirtmouth to purchase items using Geo or seek advice from the quirky townsfolk. Ancient curios called Charms lay hidden in long-forgotten chambers, and in the possession of the weird and wonderful folk you’ll meet on your quest. Find these Charms and equip them to gain helpful abilities, such as spawning enraged insects to battle alongside you or increasing the amount of Geo dropped by felled foes. The surreal world of Hollow Knight is expertly brought to life with a stunning hand-drawn art style, traditional 2D animation and a captivating original score. With incredibly detailed backgrounds and otherworldly character designs, the gloomy, dream-like environments of Hallownest positively drip with atmosphere at every turn, while a pensive, melancholic soundtrack accompanies Hollow Knight on his lonesome journey. Burrow into a cursed underground kingdom, vanquish vicious beasts and lift the curse on a crumbling insect civilisation in Hollow Knight for Nintendo eShop on Nintendo Switch.